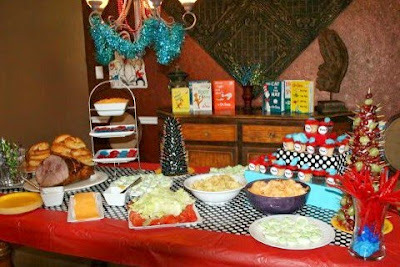 I just realized that I never posted the great Dr. Seuss Birthday party my sister hosted in October when her twins turned one. For the party, she requested a picture board with cutouts so I painted this one on some foam board for the kids to pose with. 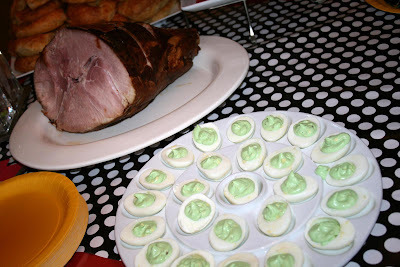 She served "green eggs" and ham. 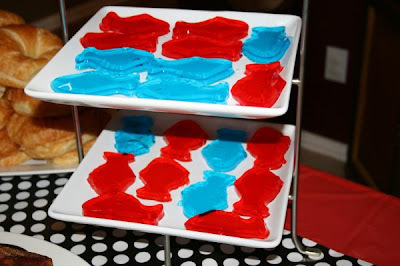 Red fish and blue fish jigglers. 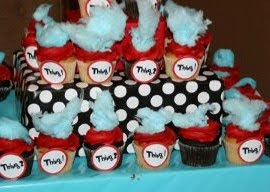 And she made these cute cupcakes with blue cotton candy on the top. 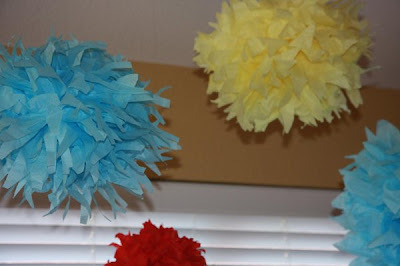 My creative sis-in-law, April, made these tissue pom-poms to hang over the gift table. 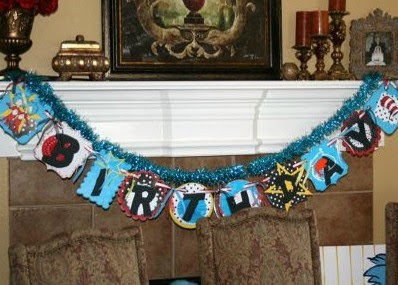 She also made this cute birthday banner. 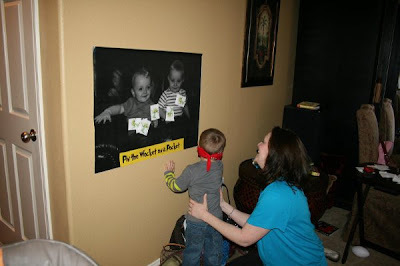 The kids played "Pin the Wocket on the Pocket" with little wockets they had to get onto the boy's pockets. They played another game where they had to relay with a fishbowl outside and then she had a jar of colorful candies we had to guess the quantity of. She decorated with lots of whimsical and bright colors, Dr. Seuss books and stuffed animals and balloons. It was a fun party and an easy theme to find things to go along with. She found plenty of cut outs and party favors around town. What a great idea! I might have to use that one for my son's birthday next year! Too bad I'll have to wait until December! A woman after my own heart!!! What cute and fun ideas! I love the pompoms!! Can you share how in the world you made such a cute cut out - so perfectly drawn? Yes PLEASE! I am making the cut out OR would honestly buy yours from you!! How did you draw this? 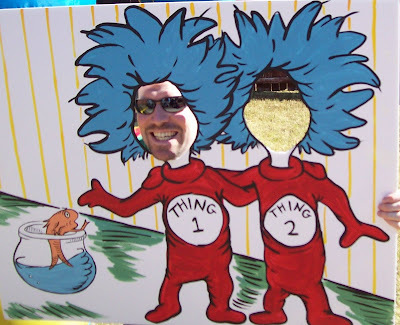 I freehanded the Thing One and Thing Two picture onto foam board I purchased at Michael's. You could certainly project any image onto it though and go from there. Wouls you be willing to make one of the thing 1 thing 2 boards for me and i will buy it from you? Sorry, but no. I drew this one on a foam board I purchased at the craft store but easiest way to do it yourself is to project the image you want onto the board and trace it then paint or color it. Good luck! How did you make the tissue pom poms? 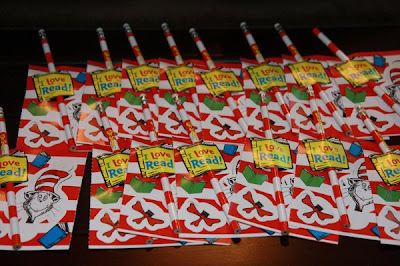 I would love to make them for our preschool Dr. Seuss Lit. Night. Tonya, there is a tutorial here for making tissue pom-poms. I'm sure there are several others out there if you just google it. I have a question. If you wanted to do the picture board with cut outs, what would you suggest if you want to have them indoors? Like how could you make it so it stands up indoors?